Our product range includes a wide range of checkered rubber mat. Insulating mats or rubber mats falls under the category of electrical safety products. These electrical mats are used as floor coverings in areas of high voltage applications for the safety of the workers from electrical shocks generally caused due to leakage of electric current. Construction Insulating Mat made from highly electrical resistant elestomer, free from any insertions. Surface Upper Surface is having small anti skid aberration marks to avoid slippery effects and lower surafce is plain. 1. The rubber mats can be placed in front of the HT/LT electrical control panels. 2. 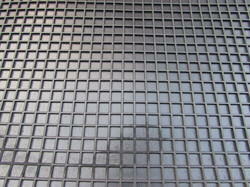 They are used as electrical safety flooring mats for the entire electrical substation. 3. Insulation mats can also be placed in the transformer, generator & lift rooms. 4. The insulation rubber matting can also be laid in front of electrical switchboards. 5. Electrical floor mat are placed around Buss Bars.